rentals. With over 40 years experience (25 plus in North Lake Tahoe) we know what it takes to run a successful vacation rental management company. 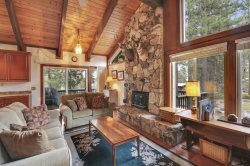 We provide a multitude of lodging options including condos, cottages, cabins and luxury homes all located on the serene North and West Shores of Lake Tahoe. We offer hassle free Tahoe rental options; from the initial search and booking to the check in and out process and everything in between, our staff and customer service is what sets us apart from the rest. All of our quality homes are cleaned and maintained by licensed, experienced staff to ensure the property is at its finest for your vacation at the lake. Whether you rent from us, or as homeowner choose us to manage your property you can be sure that you are working with the best. Here at Stay In Lake Tahoe our motto is tradition of service”. If you are considering purchasing a home in the area or selling your property we can provide you with the contacts for the most experienced top real estate agents that will make you their priority. Our goal at Stay in Lake Tahoe is to help you fall in love with Lake Tahoe so completely you will return again and again or make Lake Tahoe your permanent home. We offer a variety of well cared for homes and condos throughout the North and West shores to accommodate any renter’s needs. From a romantic getaway to a family reunion, our staff is here to provide you with information and guidance to secure the property most suited for your visit. Or if you would like to view the properties and book online our website has real time availability and calendar and 24/7 booking capabilities. Each vacation rental has its own unique set of amenities that are highlighted in our listings. Most of our properties have pool or beach access to enjoy the summer months and fireplaces to cozy up in the winter season. You will also find that the majority of our properties have additional amenities such as hot tubs, tennis access, pier access, lake fronts, lake views, and are pet friendly and are all conveniently located on or near the lake and ski resorts. Every property comes with a detailed in room book to help you navigate the property and its amenities. Our Tahoe City office is centrally located to all of our properties and is open 7 days a week from 9-5. If there ever is an issue outside of business hours we have a 24 hours emergency line to resolve any unforeseen problems. To ensure that our clients have a hassle free vacation all of our properties come with an option for accidental damage coverage and travel insurance. With over 40 years of property rental experience and 26 in Lake Tahoe we realize that every home is distinct and offers its own amenities and charm. And just as important, every owner has their own rental and financial expectations. For this reason, Stay In Lake Tahoe offers customized property management/rental programs for our owners. All of the properties that we manage are maintained with excellence and we utilize the latest marketing tactics to increase the rental income. Currently, we have a direct email program that reaches 2,000 potential guests monthly. We make use of the newest marketing trends with a social media campaign through Facebook, Instagram, LinkedIn, and a regular blog, all which highlight the properties with professional photographs, which are also featured on our website with an individual page for each property. Each property will also be highlighted as a “feature” property on our homepage of our website. In addition we employ a competitive commission structure for incentive. Each property is maintained with a professional housekeeper specific to that property. Our housekeepers conduct a post visit cleaning, pre-arrival inspection and are trained to report any problems in detail with photos via text so we have the ability to immediately take action and resolve any issues. Our housekeepers are also available for owner clean. All of our housekeeping, handyman, contractors, and service staff are very experienced members of our support team; they are licensed, reliable, and tried and true. They are prepared to change a lock, to discuss a remodel, and every project in between. We work with our owners, whether a resident or from out of town to ensure a quality product is complete and on time. As a homeowner with Stay in Lake Tahoe you will receive the ease of direct deposit for rental income, itemized statements available online, and all lodging taxes audited and paid. While every homeowner will receive the benefits of the rental programs offered, we do realize that there is a necessity for customization based on your needs and will accommodate that to the best of our capabilities. What is constant with all of our programs is our dedication to maintaining or increasing your property’s value. Our goal is to maximize your income while maintaining the flexibility of use for you. We would be happy to provide you more detailed info on our philosophy and our service to you – the owner. Please just ask by calling (530) 583-4495 and ask for Debbie.